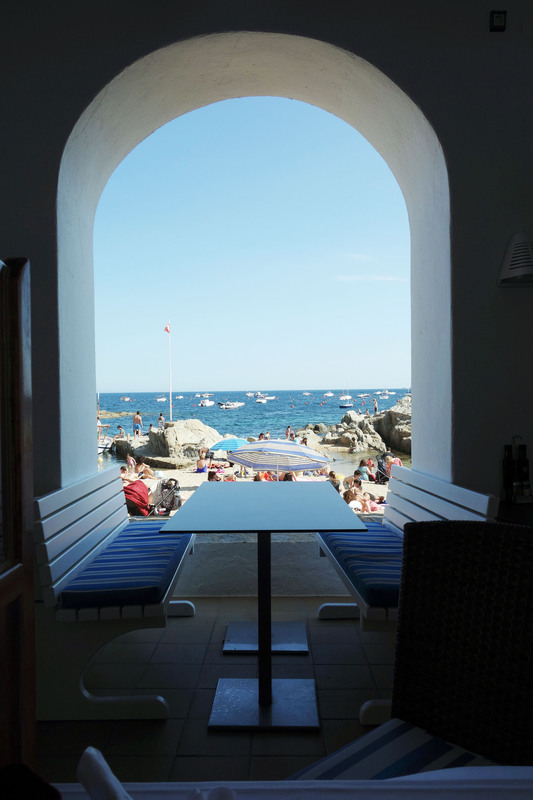 Not a very long drive north of Barcelona is the coastal town of Calella de Palafrugell, one of the three coastal towns forming the Costa Brava. The seashore boasts a beautiful string of pebble-floored coves, naturally U-shaped beaches that look as if small bites of coastline were taken by a hungry sea. Bright beads of sunshine glitter white on the breaking crest of each aquamarine wave and the glossy white bows of sailboats gleam against the mix of blues in the horizon. Scattered around the coast are large grooved boulders off which lanky boys leap to splash into cold water below, against which lazy lovers lean grooved backbones as they dry the goose-bumps off their golden brown skin. There’s tourism here but not the ugly kind, at least not yet in late May when we went. Folks are still somewhat sparsely scattered; they don’t overwhelm the beach in the least. Some drive and stay for the weekend, some rent a house for the summer. Some stay in family vacation homes passed down for many generations. There are some who hike to Calella de Palafrugell along the Camino de Ronda, a popular hiking path along the Costa Brava. Lining the beachfront promenade is a long arched tunnel housing the town’s restaurant row. These are exactly the type of restaurants I usually veer away from. Tourist-driven and overpriced terrace dining with a view of the sea or the plaza, a long line of identical storefronts all boasting the best scampi or black pepper crab or mussels with white wine sauce in town, even though they’re all probably owned by the same guy. The same products sourced from the same supplier, prepared in the same style using the same recipe. You know, that seafood menu that also offers burgers and Caesar salad, just in case. The chef with all creativity muted stuck in the kitchen. The waiter who smiles as he takes your order, purposefully neglecting to tell you that each of the three dishes your ordered is enough for an entire table to share. Paella on the Rambla with a monumental jug of watered down sangria. No thanks. But this is not that, or at least not exactly. 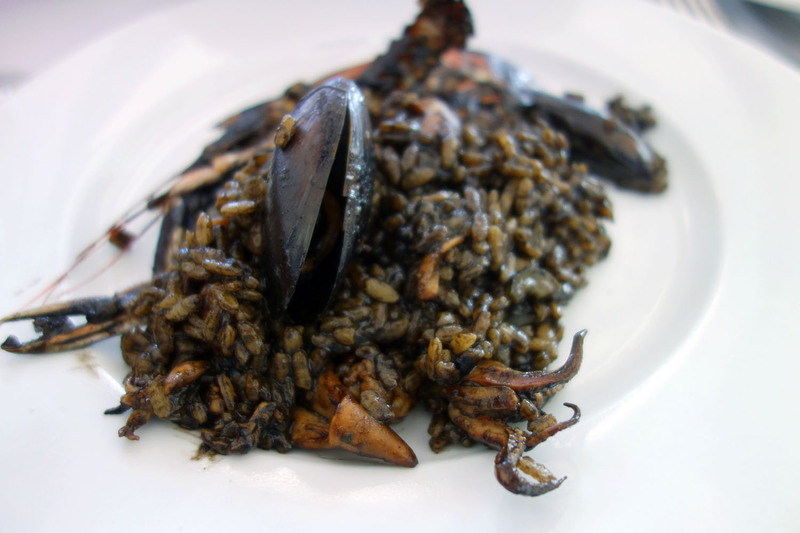 We went to Palafrugell for the pristine Mediterranean beaches and to eat arròs negre, a dish that pretty much every restaurant in this town does better than most restaurants in Barcelona. We arrived to the feeding block a bit too late in the afternoon and half of the row was already shutting down for midday siesta. But we found one that seated us and without checking the name of the restaurant or its menu we sat and ordered a chilled bottle of rosé. It came, from the region of Empordà and was delightfully delicate and dry for the price. Chipirones are a snack I would not order in most beachfront restaurants in Barcelona simply because I never luck out on quality. 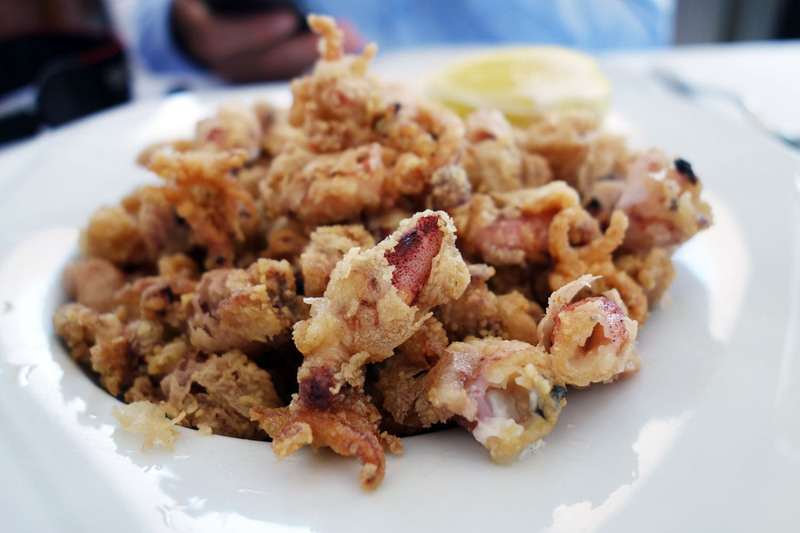 I always expect fresh pink baby squids tossed in a crumbly, thin batter and lightly fried for a slight crunch, while the interior remains tender and smooth. So far what I’ve gotten has always been quite different: rubbery rings and tentacles coated with a thick and starchy shell that soaks up so much excess oil during the deep-fry that each bite is dense and dripping with it. This is generally the type of greasy, disgusting dish that makes one drape clothes over the bikini bod and crave for a nap rather than an active afternoon on the beach. It also happens to be my boyfriend’s guilty pleasure. When he sees them on a menu at a chiringuito his eyes meet mine cautiously and he whispers, “CanIpleasegetsomechipirones.” He becomes the little boy pointing at a stray pup and coyly asking his mother, “Please, can we keep him?” It’s the same tone I use when I come across chicharrones in a market, my beloved fried pork rinds that make him cringe just as chipirones make me do. Usually a disapproving expression is enough to dissuade him from ordering them but sometimes… Sometimes he’s going to get some damn chipirones, whether I like it or not. This happened at Les Voltes and I’m glad it did because the chipi’s there were some of the best I’ve ever had. Beautiful pink spotted baby squid peaked out from a paper-thin layer of brittle fry-coat, which offered each bite a sandy texture, a warmth and a beautiful crunch without leaving a single trace of excess grease on the tongue. 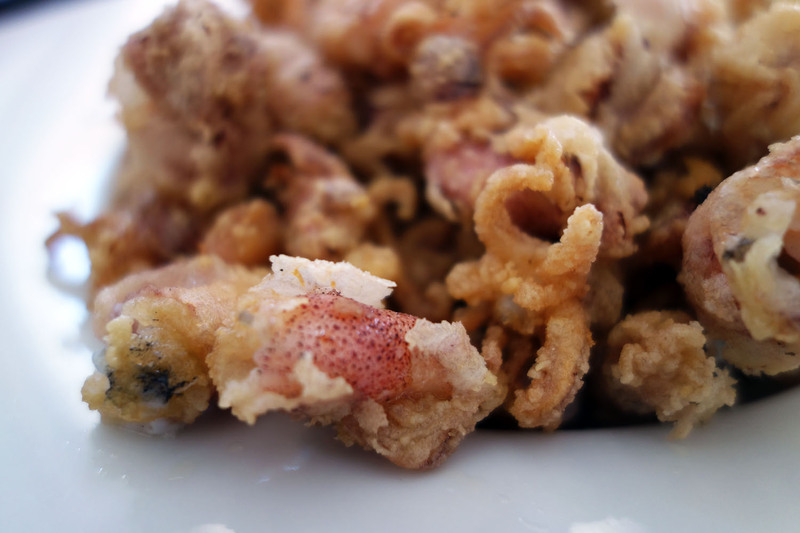 While the batter crisped up the squid cooked to the perfect texture, firm yet butter soft inside. An absolute joy to eat. We attacked the dish from two sides and grew noticeably quieter in our chatter as we pierced 4, 5, 6 squids onto each fork. 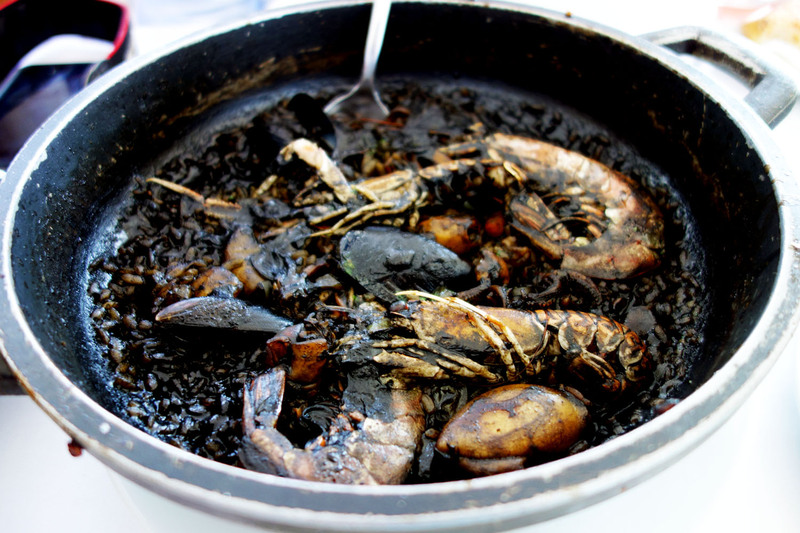 As planned, we ordered the arròs negre, a cast iron pan full of jet-black rice cooked with squid ink and seafood broth. 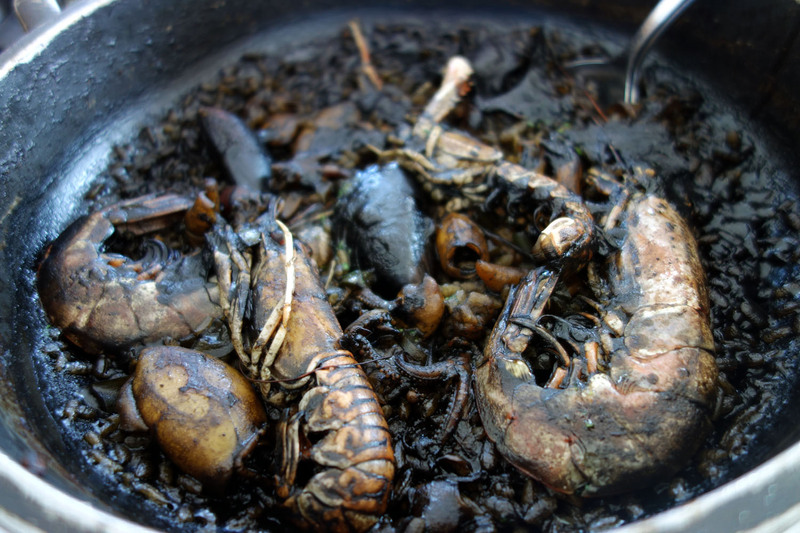 Cuttlefish, baby squid, mussels and prawns adorn the top like critters digging through a wet, warm puddle of mud. It’s a dramatic and beautiful dish to behold. The rice has a wonderful texture too. It collects in fluffy soft, moist lumps in the center of the pan, while the rice scraped off the rim is delightfully crunchy. I’m not generally a big rice eater as the starchy grains tend to fill me up too quickly, leaving me feeling simultaneously heavy and dehydrated. Normally with this type of dish I would pick the seafood out of my portion and be quite sparing with the rice. But, in this case, it’s impossible to resist the fluffy black mounds of the stuff. Each mouthful is steamy, warm comfort. 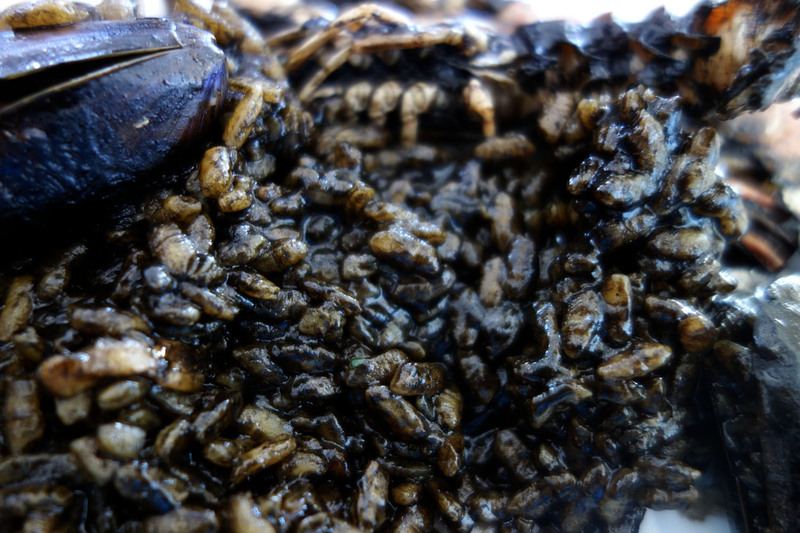 The moisture wafting off the surface of this dish exudes the essence of the sea with the squid ink and stock adding a slightly rotten sweet, briny and marine flavor to the rice. The shellfish is cooked through perfectly and while the prawns take a bit of work to deshell with knife and fork, the squid, cuttlefish and mussel mix right into the rice so that each forkful has at least one piece of soft marine protein to complete it. Pleasantly satiated and slightly buzzed from the wine we wandered out to the beautiful pebble beach just a few steps from our table and stretched out under the soft, warm rays of a perfect 6 p.m. sun. It was one of those great and memorable moments, an hour of blissful comfort and joy that I will remember all my life. Our experience in the coastal town of Palafrugell would not have been complete without the wonderful meal of rice and (I assume) local seafood. The food alone makes this out-of-the-way paradise a worthy destination. June 9, 2015 in GIRONA.